EDITOR'S NOTE: Read the latest about this story here. MIAMI -- The brother of the teen charged with killing 17 people at a Florida school was arrested Monday afternoon for trespassing at the same school, authorities said. 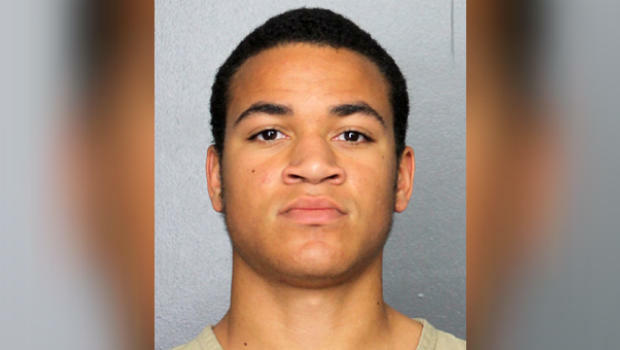 Zachary Cruz, 18, was arrested at Marjory Stoneman Douglas High School and charged with trespassing on school grounds, a Broward Sheriff's Office report said. Zachary Cruz told the arresting deputy that he was there to "reflect on the school shooting and to soak it in," according to the report. It added that the teen had "surpassed all locked doors and gates and proceeded to ride his skateboard through school grounds." The youth's brother, 19-year-old Nikolas Cruz, has been charged with 17 counts of first-degree murder in connection with the Feb. 14 shooting. Jail records didn't immediately list an attorney for Zachary Cruz. Meanwhile, a group of survivors of the shooting at Stoneman Douglas High School who refer to themselves as the "mass-shooting generation" have made it their mission to bring about gun reform and appeared on Sunday's "60 Minutes" broadcast. "The thing about it is, we are the generation that's had to be trapped in closets, waiting for police to come or waiting for a shooter to walk into our door," Alex Wind told CBS News. "We are the people who know what it's like first-hand." "We're the mass shooting generation," Cameron Kasky says, pointing out that he was born after the Columbine High School shooting -- meaning mass shootings have happened his whole life.